Digi-Schlock: INTRUDER (Blu-Ray/DVD Combo) – Schlockmania! Some titles spend decades waiting for justice in the home video format. A textbook example of this truism is Intruder: when it debuted on video at the end of 1980’s, original distributor Paramount sheared off all its gory highlights to get a quick R-rating and never gave fans the option of an unrated cut. In the DVD era, it earned a European DVD release in its uncut form and late-but-welcome 2005 domestic disc – unfortunately, both had weak transfers that weren’t much better than the bootlegs fans had been passing around for years. 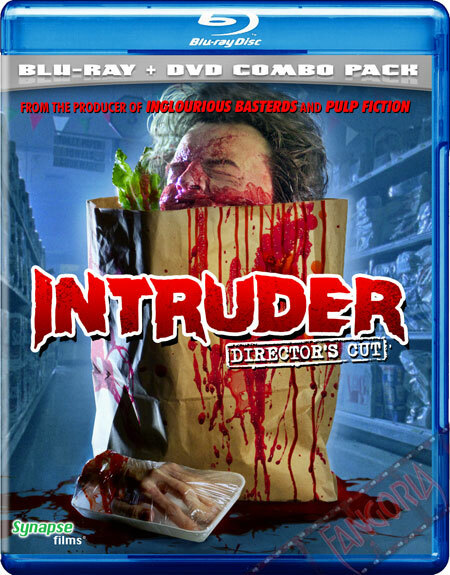 As a result, the idea of having a good-looking, complete version of Intruder became a holy grail for fans of 1980’s horror – and that grail has finally been unearthed by Synapse Films. That label has been doing a lot of fine reissue work this year – Maniac Cop and The Exterminator, to name just two – and their deluxe blu-ray and DVD edition of Intruder maintains the standard of quality those releases have established. It all begins with a strong new high-definition transfer: the color palette is rich, the detail is crisp and black levels are appropriately thick during the night photography and shadowy interiors that dominate the second half of the film. Whether you watch it on blu-ray or DVD, it’s the best looking version of this film to date (advice: the blu-ray is the way to go). The mono soundtrack is left intact but given a nice upgrade to an uncompressed, DTS presentation. All in all, another excellent digital upgrade of a vintage cult fave from Synapse. There is also a jumbo array of supplements for fans to dig into. First on the slate is a commentary track by writer/director Scott Spiegel and producer Lawrence Bender. The tone of this track is enthusiastic as both men look back on the film with great fondness. They share stories about the different members of the cast and crew, the challenges of capturing particular gore effects and even poke fun at the music library material used on the soundtrack. Spiegel is surprisingly clean-cut for a goremeister, frequently accompanying the on-screen shocks with exclamations of “Good grief!” They surprisingly avoid the negative circumstances of the film’s original release but it’s a decent track overall, with some nice nuggets of trivia for the film’s fans. And that’s just the beginning. On the small scale, you get expected things like two trailers (one of them a video spot for the original Night Crew title) and a juicy gallery of stills supplied by FX man Greg Nicotero. The latter concentrates on the shocking effects images that fans remember seeing in the old Gorezone promotional article on this film. There is also ten minutes worth of audition footage that is interesting because it features a different version of the first scene with the heroine’s ex-boyfriend. The most interesting of the short format inclusions is a 6-minute presentation of outtakes from the original 8mm version of the film (the finished version is missing) that Spiegel cut together for this release. Fans will be interested to see that Spiegel retained several shots and bits of business from the short for his feature version (however, he handles the bandsaw killing in a different way here). However, the best inclusion on the set is “Slashed Prices,” a new 38 minute featurette put together by Michael Felsher. It’s built around interviews with Spiegel, Bender and most of the film’s cast (sadly, no Sam Raimi but you do get Bruce Campbell). Everyone looks back at the experience with nostalgic fondness and they all muster up a fun anecdote or two – the best might be from star Elizabeth Cox, who breaks down the five different types of screams she used in this film. 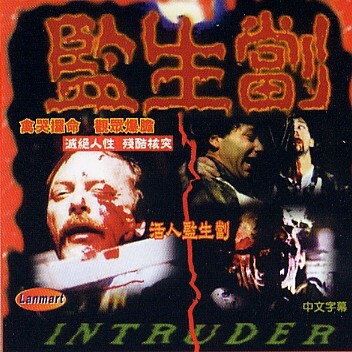 Even Charles Band, the film’s original co-financier and distributor pops up to explain why Intruder‘s original home video release went awry. It’s a fast-moving, colorful piece that makes good use of clips from the film. If that’s not enough, there’s also an interesting bonus from Felsher and crew in the form of “The Slashing Of Intruder,” a short interview with filmmaker/fan Vincent Pereira. It starts as a tale about how discovered Intruder as a young horror buff but incorporates a nice story about Spiegel into its finale. 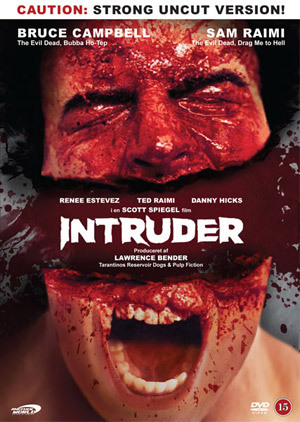 In short, Intruder is yet another strong catalog release from Synapse, delivering an excellent transfer and plenty of quality extras. Fans of the film shouldn’t think twice about snapping it up.